Wow, there are two exhibitions & sales coming up about the same time. I am so excited! In its fifth year, the Norfolk Collegiate School Art Show & Sale includes selected works from over 60 juried artists, demonstrations and workshops, a family ice cream social, showcases of student artwork and five days of open house to view and shop for original artwork. Open house days are open and free to the public. I am exhibiting several surreal paintings for sale. I’ll be at the opening “Off the Wall Party” on 25th 7-10pm, a ticketed event. The evening will also include live musical entertainment by “Broke by Sunday” and cooking demonstrations by local chefs. Tickets include buffet by SAGE, wine and craft beer tastings. This annual exhibition features the art work by many of the over 250 Hampton Arts League members in all media, including drawing, painting, printmaking, photography, crafts, sculpture and watercolor. 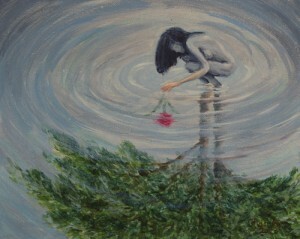 I’m submitting my newest surreal painting. I’ll be at the opening reception on 27th 3-5:30pm. There will be wine and delicious finger foods served. Admission free for this event. 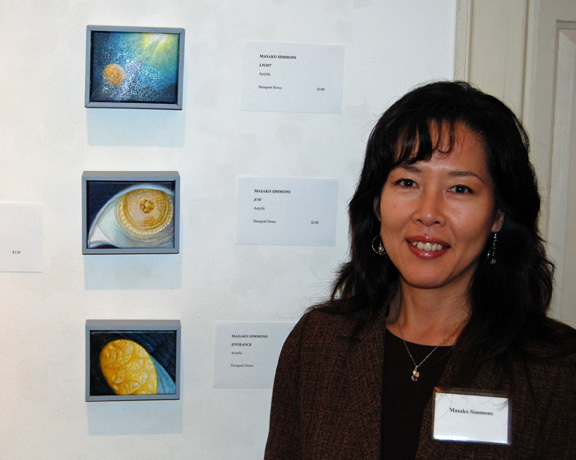 This is my third exhibition at Charles H. Taylor Arts Center for this open members exhibition. Opening is always packed! It will be awesome this year as well. On the other hand, exhibition at Norfolk Collegiate School is my first. Both will be great opportunities to meet other artists and art lovers. I’m looking forward to it! 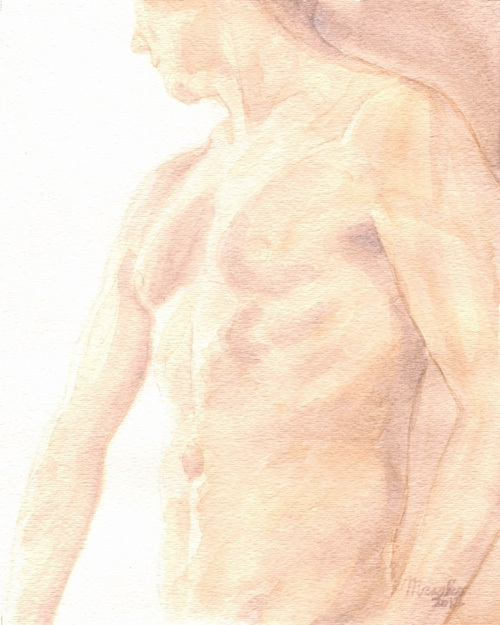 My primarily work is surreal or abstract in acrylic, but I painted male torso this time in watercolor. This is something new and I had painted a few more as a series. This maybe my new direction for 2012. Who knows…? This painting “Male Torso” will be exhibited in the annual members exhibition for 2012. October 23, 2011 Sunday at the Charles H. Taylor Arts Center. All small works in different mediums. Tiny watercolor paintings, tiny oil painting, tiny acrylic painting, tiny sculpture, tiny clay, tiny mix media, etc., etc… I had a great time at the opening reception except my feet. I rarely wear high heels and they were killing my feet!The exhibition still continues until Dec. 4th. I hope a lot of people get a chance to see all fine art in Hampton Roads Virginia. 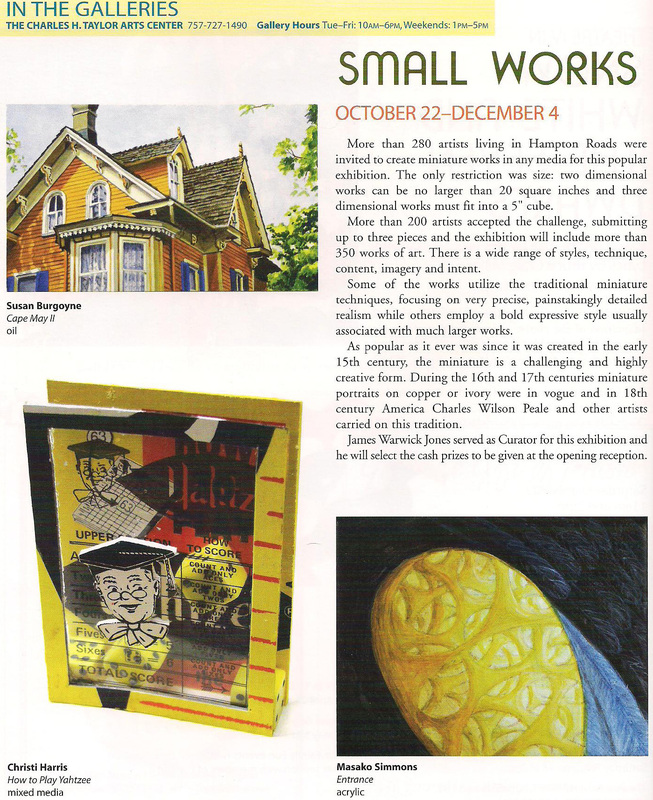 Small Works at The Charles H. Taylor Arts Center. Invited artists were challenged to create art works less than 20 square inches for Small Works Exhibition. The resulting exhibition includes over 400 works in all media by more than 150 artists. The information of this exhibition was introduced in the magazine, Diversion, and one of my works “Entrance” was featured. Please join us for the Opening Reception, Sunday, October 23, 2:00-5:00 p.m.